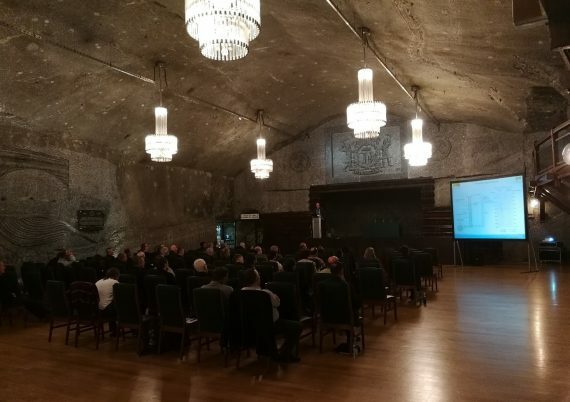 On November 8-10, 2018, the 18th edition of the international Altbergbau-Kolloquium conference took place in the undergrounds of the Wieliczka Salt Mine. The subject of the conference concerned with "old mining". The Strata Mechanics Research Institute of the Polish Academy of Sciences in cooperation with Wieliczka Salt Mine was the organizer of the conference. Honorary patronage was taken by the President of the State Mining Authority, dr inż. Adam Mirek. During six scientific session, 40 papers have been presented. The participants could share their experiences connected by modern measurement and observational methods using in old mining excavations, assessment of their stability and microclimate, the problems associated with liquidation of mines and new guidelines of EU in terms of old mining areas and their reclamation. The participants were mainly scientists and industry representatives from EU countries, e.g. : Germany, Poland, Austria, Finland, Ireland, and outside of the Europe: Australia and South Africa. The next edition of Altbergbau-Kolloquium conference will take place in November 2019, in Leoben (Austria).